“Listening to the noon going down in the romantic town, a Da Lat-violet is filled with fog…” (written by Minh Ky, Da Cam) is lyric of a famous song about Da Lat – one of the top prioritized destinations in Vietnam for its romantic and flowerful beauty. Located in the South Central Highlands of Vietnam (Lang Biang Highlands), Da Lat was originally the playground of the French , and today’s “valley of love”, surrounded by cool, fresh and silently charming atmosphere. What is more, Da Lat has two distinct seasons, the rainy and the sunny ones. The former is from May to October, and the former from November to April. Tourists should be prepared for sudden rains in sunny season, sometimes rocky ones. Never in Da Lat could we ever catch a storm, which make it favorable for tourists to take any daytime leisure walk. Today, Dalat is undoubtedly a beautiful tourist town. The vast majority of visitors are both domestic and foreign tourists on short package tours, drawn by the scenery, vivid blue skies, fresh air, flower-filled parks, and local edible treatment. 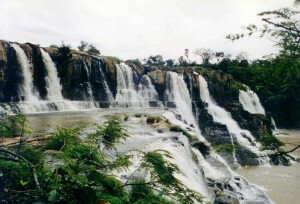 Dalat is a favorite destination for company weekend outings, family get-aways, and most of all, honeymoons. For overseas visitors, it offers a chance to cool down, view a bit of the French legacy, and enjoy the atmosphere. Also, Da Lat is surrounded by some of the best mountain biking, hiking and canyoning opportunities in Vietnam. Da Lat’s high altitude of 1,500-2,000m and fertile landscape make it one among Vietnam’s premium agricultural areas, producing a variety of fruits, vegetables and flowers that do not grow in the lowlands. In markets as far north as Hanoi Vietnam, vegetables and flower vendors will tout their “made in Da Lat” produce.